Yesterday I was bestowed with an Award. It made me smile and since smiling is my favorite I want to send a big thank you out to Jacqueline over at Love You Mean It. If you haven't checked out her blog you should. She's great! Now...for the Award. 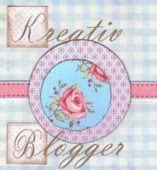 It was the Kreativ Blogger Award! Without further ado...here is my 7 things you may not know about me. 1. I'm all about being mobile. My phone constantly has me on yahoo instant messenger. I'm always checking my facebook, twitter and myspace (however I am deleting myspace very soon because I feel it's become skeezy). Thank goodness for technology! 2. I don't wash my hair every day. Don't get me wrong...I shower every single day but I just don't wash my hair on a daily basis. It's long and if I do that it would constantly look as if I've been chewing on an electrical cord. 3. I have recently become addicted to watching NCIS. I haven't blogged about this yet but I love it! It's like crack tv. Everytime USA has it on, I've got my television tuned in. 4. I hardly ever chew gum but if I do it's the whitening gum. Why not kill 2 birds with 1 stone?! 5. I cannot stand Woody Allen. I don't know what it is about him but anytime I see his pictures or he's on tv, I get this uncontrollable urge to punch him in the face. 6. I think Keanu Reeves (think his Speed movie era) is the sexiest man. I mean really. 7. When I was in middle school and we had to change for gym. I would always wait till there was no one around to change my shirt. Hello....I don't show the ta ta's to just everyone. Now...for the nominees! First of all I want to say that I love you all equally. If you didn't get nominated right now, don't cry. Trust me one day I will give you an award. Because honestly I wouldn't follow you're blog if I didn't like you. I hate Woody Allen too! I don't know why either, I just cannot stand him. I never check who is in a movie before I watch it and if he pops up on the screen I often stop watching! I got rid of my Myspace for the same reason, Facebook is much better! Thanks for offering a hotel reconmendation, but that is the one thing we already have! But any suggestions on what to do or places to eat would be great! Congratulations! I love NCIS, too. Its my guilty pleasure. I'm in love with Gibbs. Like HUGE crush. Congrats on the award! I don't wash my hair everyday either....my husband used to think this was gross. He got over it. Thank you for the nomination! I also love NCIS. If you do end up coming here I can either a. lend you all the DVDs of the older episodes or b. we can have a few NCIS-athons. Thank you! Woody Allen gives me the heeby jeebies.